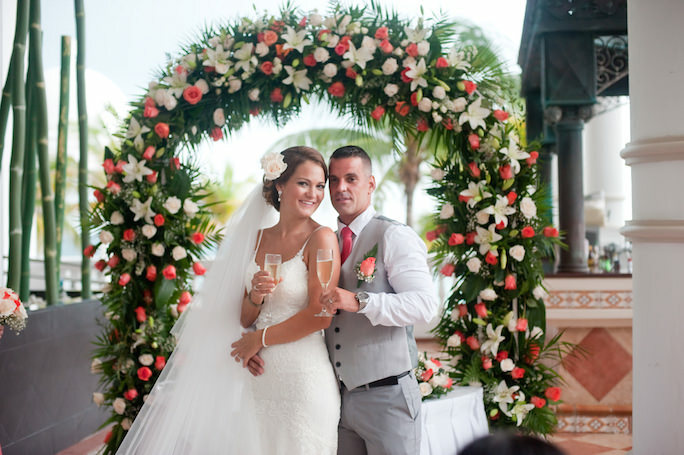 For most couples, hiring the right wedding photographer is very important to them, and it should be. In my experience, there is also another important decision that many couples do not give enough attention to; choosing your photo sessions. 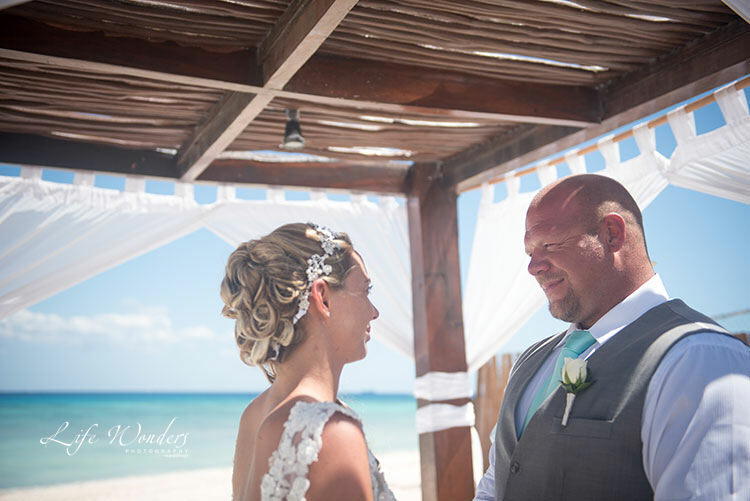 I will explain all the different photography possibilities on your luxury wedding day so you can make an informed decision and create a memorable collection of wedding photographs that you will cherish for a lifetime! These are the photos you will share with friends, family and eventually your kids and grandkids. I want you to have the best day of your life and have it captured! 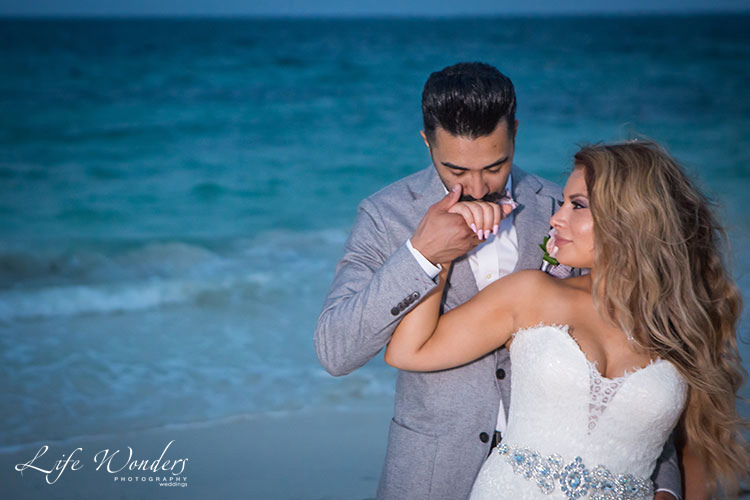 I have had brides tell me they are glad I explained the different possibilities and the importance of each type of photo session, so that they could make an informed decision and get a collection of photographs they cherish forever. In this way, they do not go home and wish they had photos of the Getting Ready session or photos by the beach. Yes, it is true! Once you choose your photographer, make sure you request a variety of photos — both portrait sessions and spontaneous photographs. 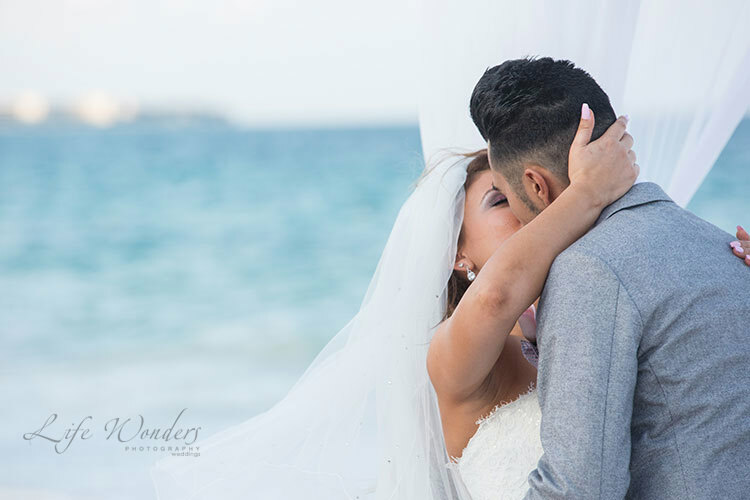 When you choose me as your photographer, I capture all the biggest moments of the day, so I ensure you have swoon-worthy wedding photos to look back on. Dana looks super excited while hanging out with her loved ones, getting ready for the big moment! 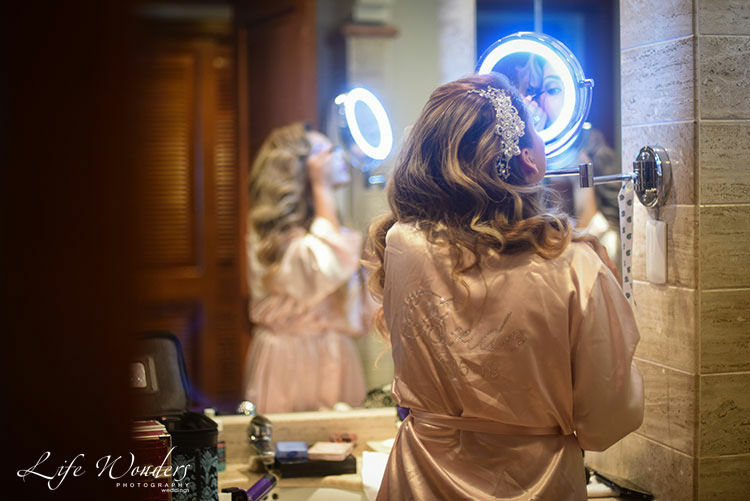 These intimate photos of the bride and groom getting ready in their separate hotel rooms are instant keepsakes. In the Getting Ready photos, I will capture lovely moments with friends and family in a relaxed atmosphere, as well as detail shots of makeup, the bride’s dress, shoes, jewelry, wedding rings, flowers, and pre-ceremony bridal portraits … along with the groom’s dashing bow tie, the groom having a good time with his buddies, a pre-ceremony portrait of the groom, and all the other little items that add up to a unique wedding. Getting Ready photos have a “behind-the-scenes” feel to them; they are relaxed and fun. Andrew is getting ready and looking very sharp on his wedding day. He had style. 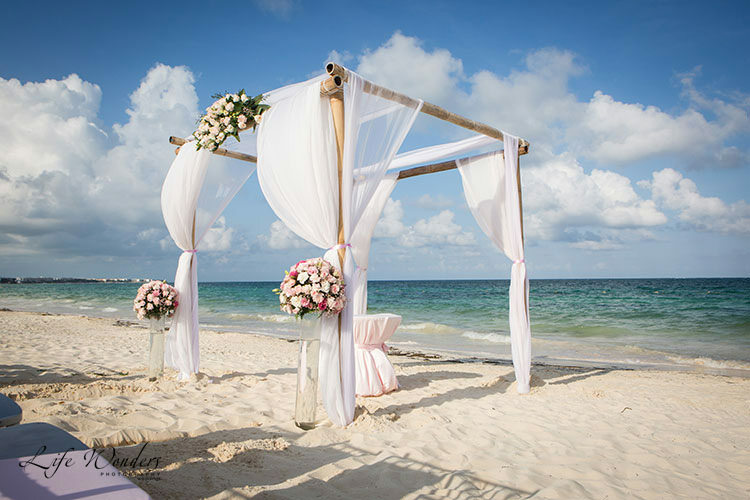 You worked so hard planning your perfect destination wedding, and you don’t want to forget a moment of it. 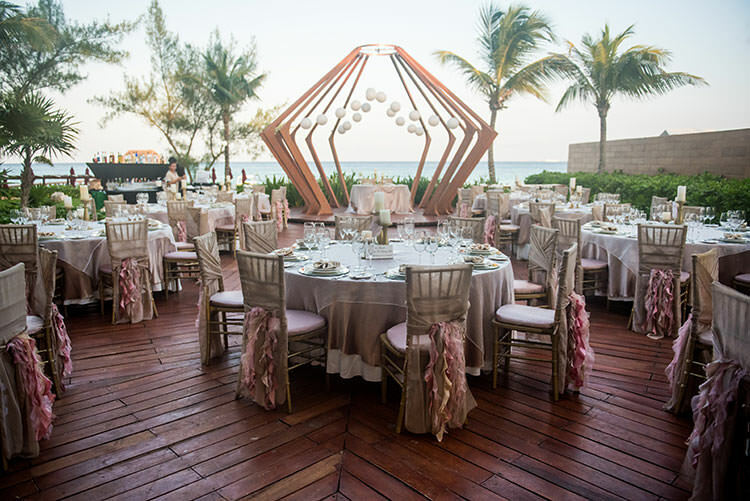 That’s why detail photos of the ceremony site and reception are so important. Typically, these photos are taken before the ceremony so that I can focus on all of the beautiful details before the location gets crowded. 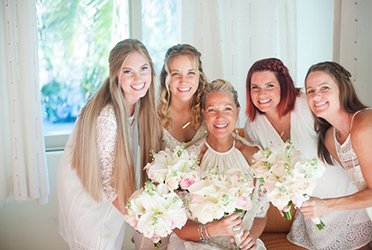 You’ll receive beautiful photos of your floral arrangements, place settings, welcome gifts, and all the other items that you added your special touch to. 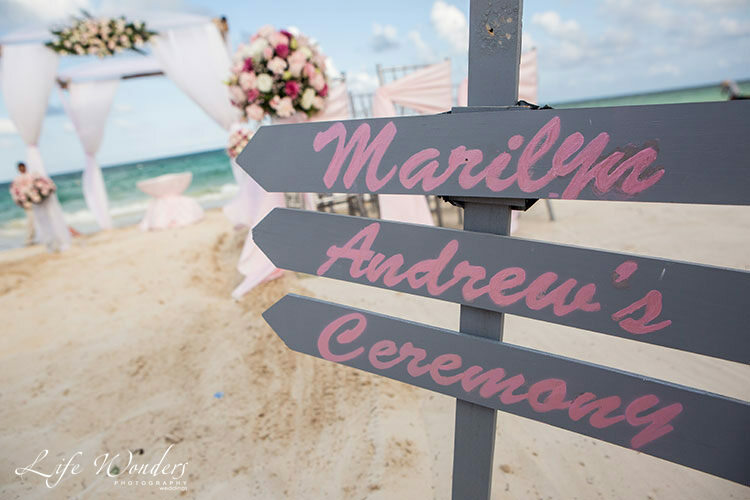 A wedding direction sign can be helpful to your guests but also adds an extra level of elegance and enhances the feel of your wedding. 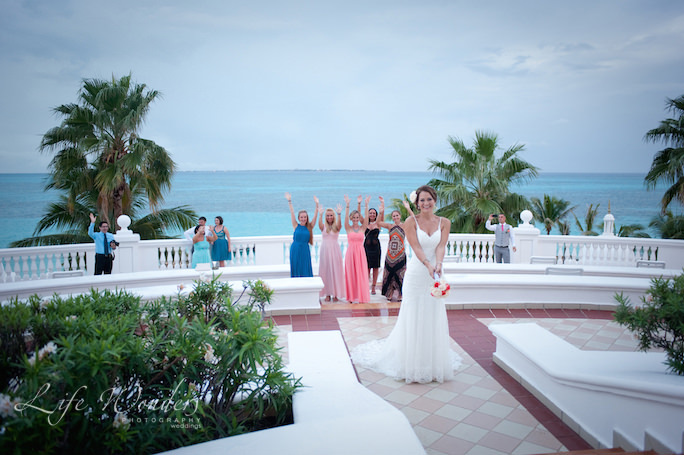 I love these types of photographs to document your setting and to show off the beauty of your wedding. 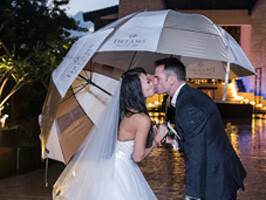 This is a magical moment…vow exchanges and a promise of “happily ever after”. Talk about a “must”! This is when all the emotions come out, and I work hard to capture it all — the walk down the aisle with Dad, the moment he gives his “little girl” away, the oh-so-cute procession of the flower girl and ring bearer, all the audience reactions, and the moment the couple says “I Do.” Sometimes, it’s nice to have a second photographer helping with ceremony photography, so you have plenty of photos of the couple and everyone in attendance Photographing the groom’s expression as he sees his bride for the first time and the bride walking down the aisle is always a great photograph. I always capture the dramatic backdrop during the ceremony. It is a moment to cherish forever. Look how happy Ursula and Ben walking down the aisle. They’re ready for a new life together. Marilyn and Andrew as husband and wife. The expressions on their faces are priceless! They are so happpy! I can see love in their eyes. Andrew embraces Marilyn a lot during the bridal couple portrait. He’s indeed in love. After the Ceremony photos, I think the Couple Portrait photos are the most important photographs of your day. 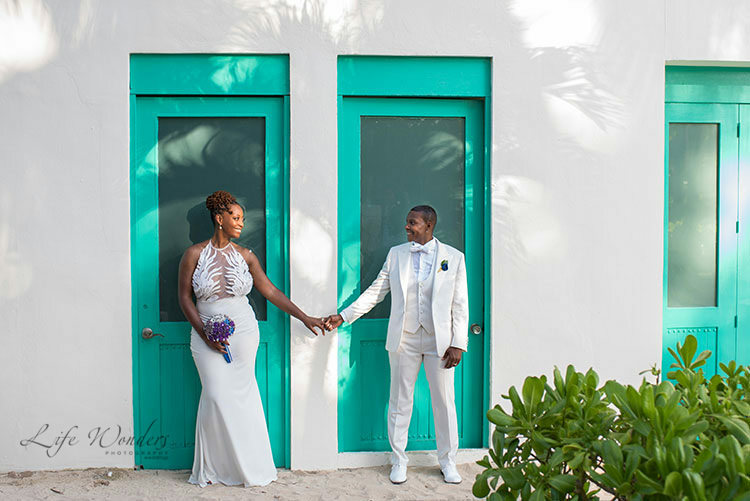 Typically taken right after the ceremony, these photos capture your first moments as husband and wife — when you’re full of love and gratitude for one another. Plus, I capture the playfulness between the two of you! 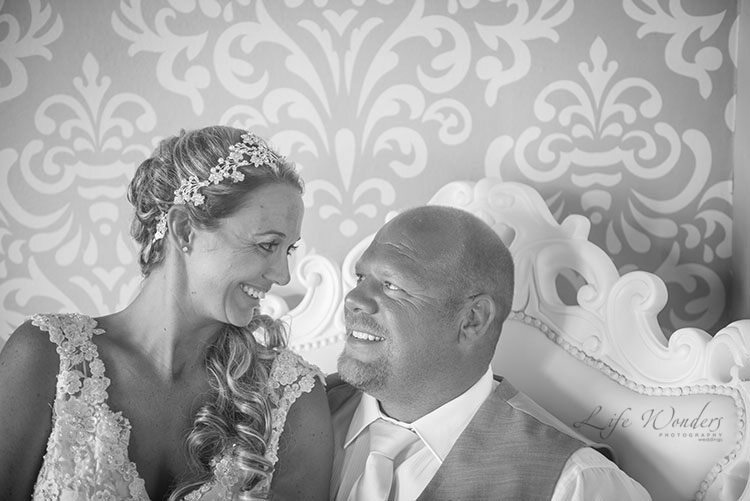 I love photographing Couple Portraits because I really see the special bond that each couple has shine through. 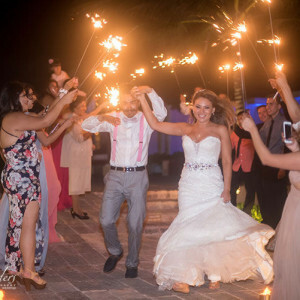 All smiles for these newlyweds. I love this backdrop! These photographs will be beautiful and timeless. 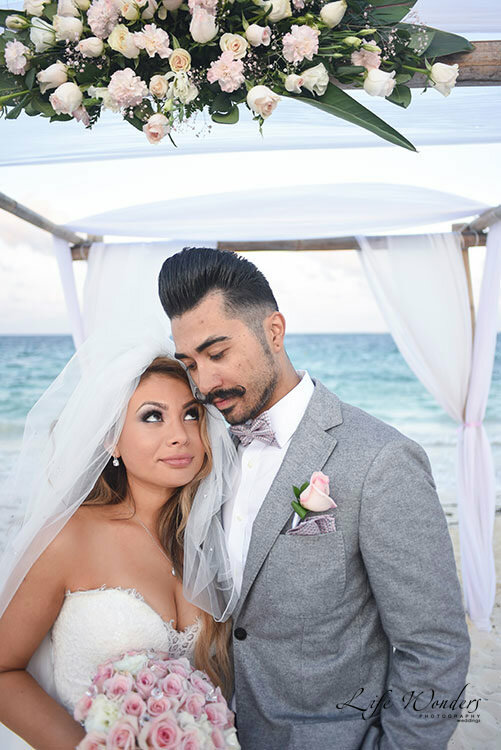 I will give you direction to help you look your absolute best and so that the final photos look natural, spontaneous, and effortless. 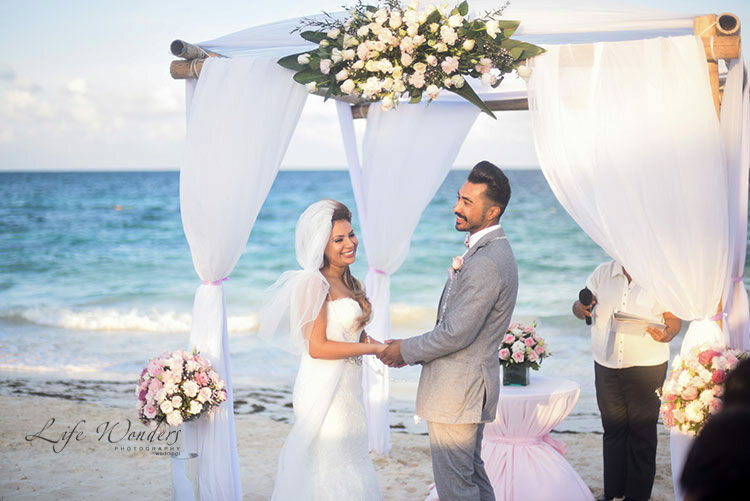 These photographs can be taken in the most gorgeous spots around the resort or beach to capture the destination wedding feel. I love their expressions. 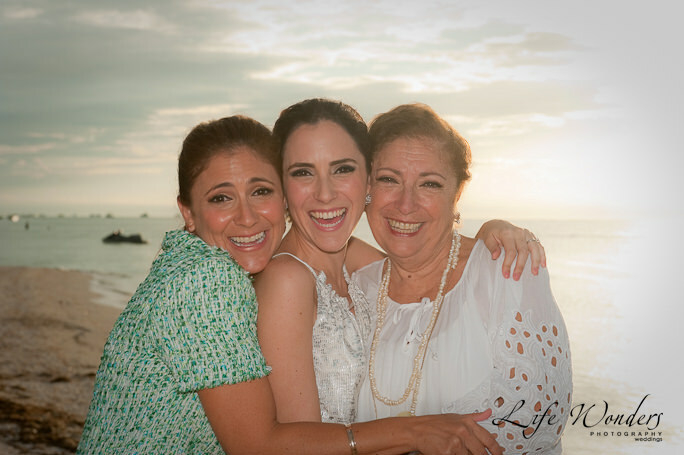 These ladies share an emotional moment with the new bride. 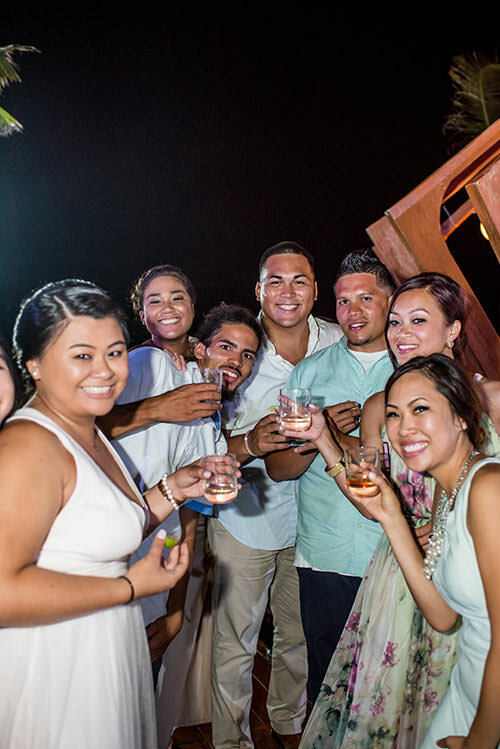 These photos will become keepsakes that help you remember the loved ones who joined in to celebrate your big day. Plus, more formal portraits with family and close friends make great “thank you” gifts to send out after the wedding. 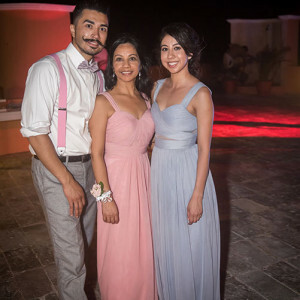 These are formal family portraits with the bride and groom taken directly after the ceremony. 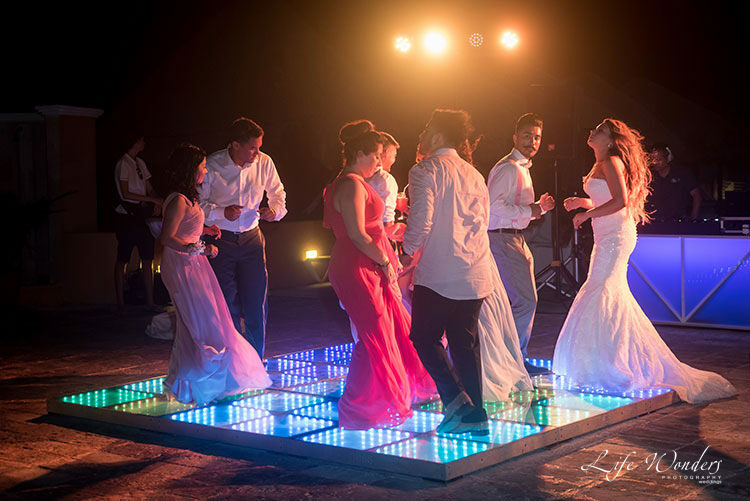 Everyone is thrilled to be a part of this unforgettable party. Astonishing in her beautiful dress, the stairs dramatically showcase Dana’s lovely long train. 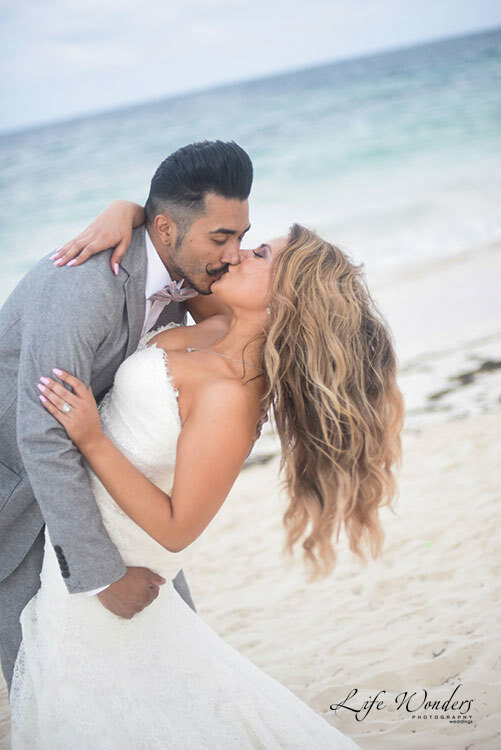 Brides spend months picking out the perfect dress, shoes, and hairstyle — remember yourself looking your best (and most in love!) 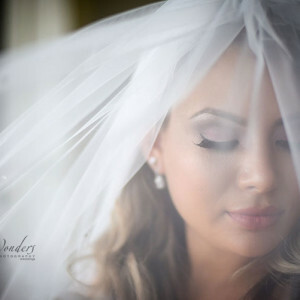 with a special bridal portrait session. This portrait session gives us the opportunity to capture close-up details of the dress, shoes, make-up look, and bouquet too. 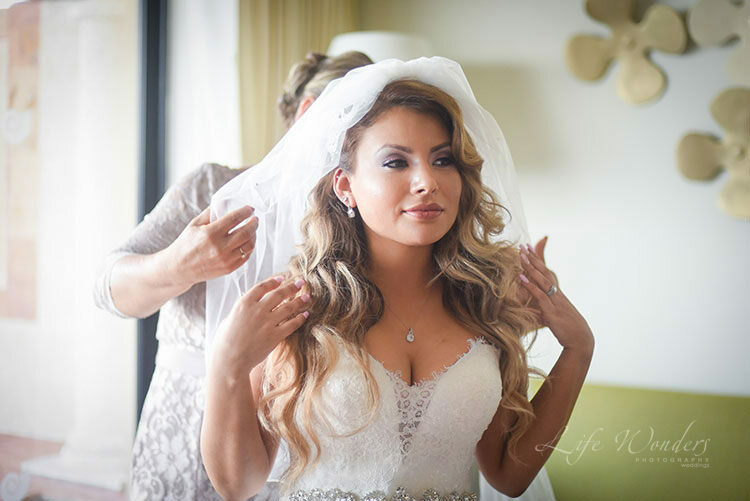 It’s usually best for these photos to be taken before the ceremony, after the bride is done getting ready. 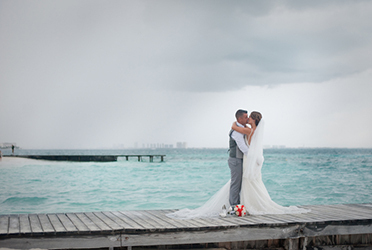 These breathtaking photos make a great gift to the groom (or partner) and the bride’s parents after the wedding — pick out a few of your favorites that you know they will cherish forever. 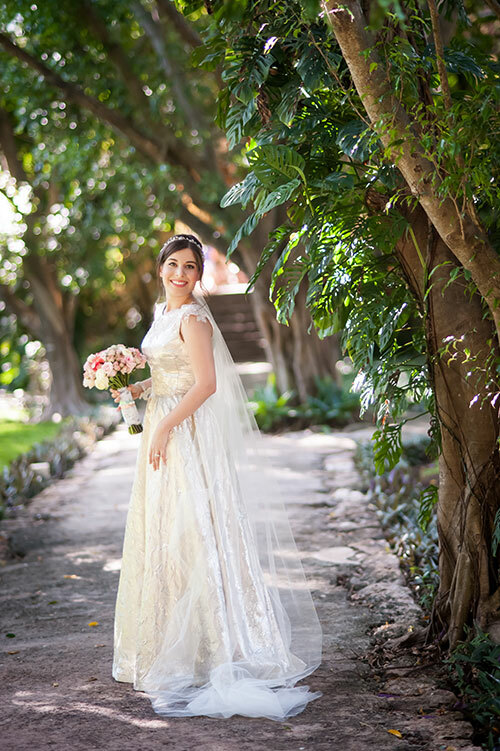 Andrea is so beautiful and this lush green surrounding gives her a fairy tale photo. The guests get a chance to loosen up! 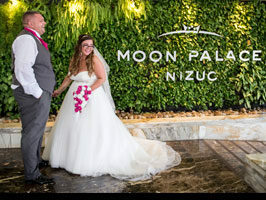 As the Couple Portrait photos are taken after the ceremony, couples usually host a cocktail hour for guest to attend while they’re having their photos taken. 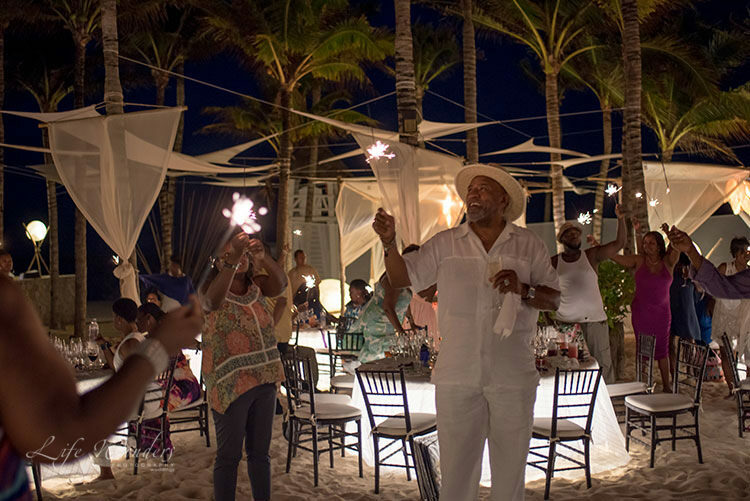 It’s the first time that all of a couple’s family and loved ones get to mingle after just watching the couple say “I Do” — so emotions are running high! 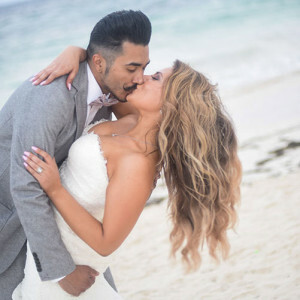 To capture it all, I recommend also hiring a second photographer, who can take fun, spontaneous photos of guests in a relaxed environment during the Cocktail Hour while I work with you on your portrait photos. 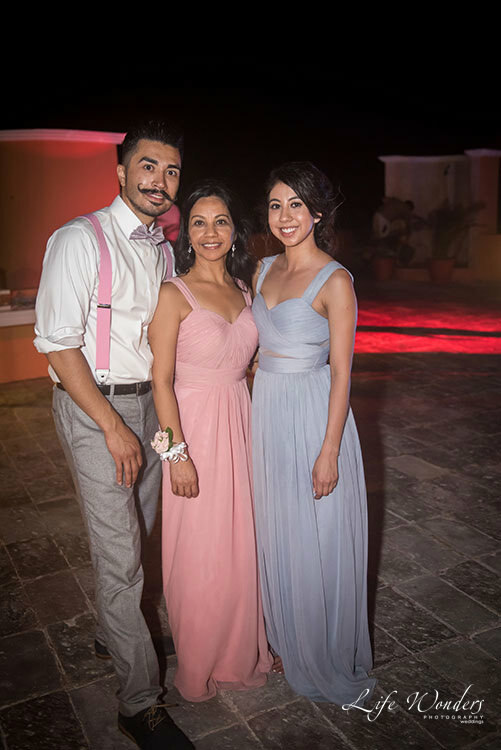 I love to capture friends and family having fun at your wedding. This will allows be remembered! The night doesn’t end with the ceremony! 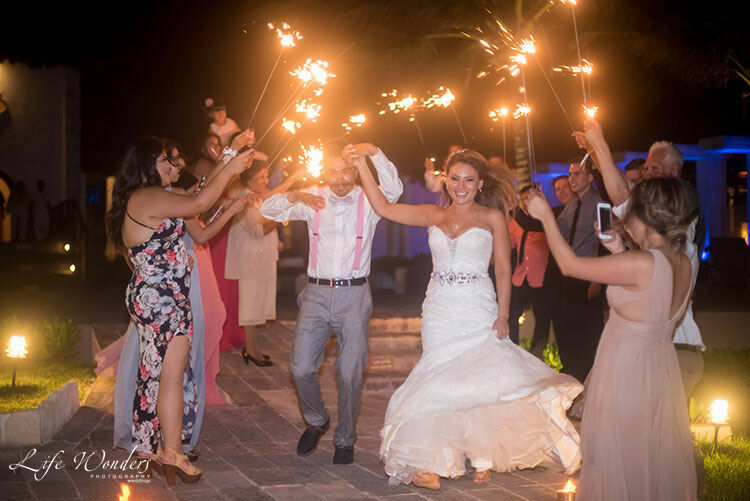 I always love to photograph the important, once-in-a-lifetime moments of the reception, like the first dance as husband and wife, the father daughter dance, the mother and son dance, cake cutting, speeches,and the bouquet and garter toss. Consider having these photographs in your album. 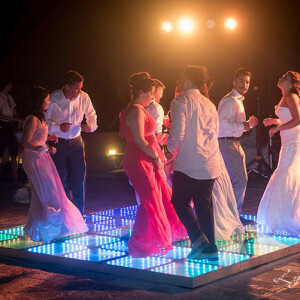 Plus, this is when your guests can really cut loose — you’ll love and laugh over the photos of them shaking it on the dance floor all night long! Marilyn and Andrew’s first dance as husband and wife. I love the lighting! We can feel love is in the air! 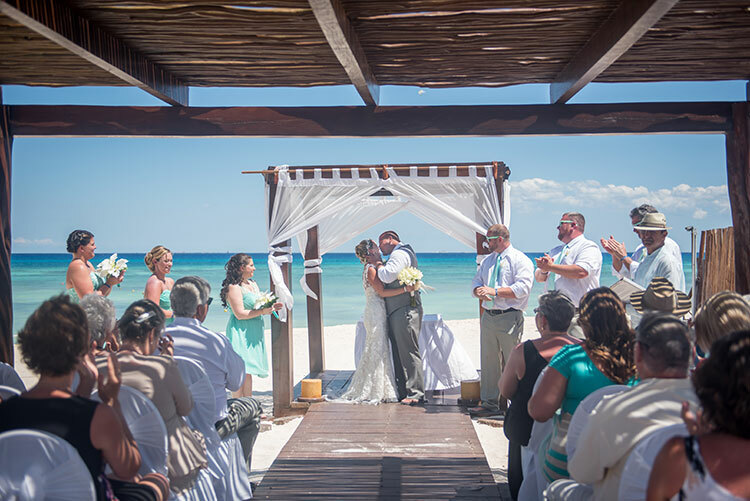 One thing I love to do is photograph sweeping shots of the ceremony location itself — you chose to have a destination wedding in Mexico so you could be married in one of the most beautiful places in the world, so you’ll want photos to remember all of the beauty by. 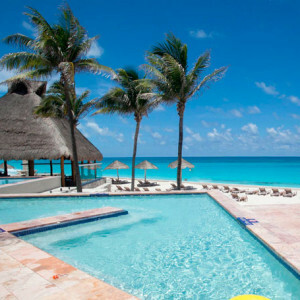 I love how this photo shows the turquoise color of the water giving a spectacular contrast to the setting. 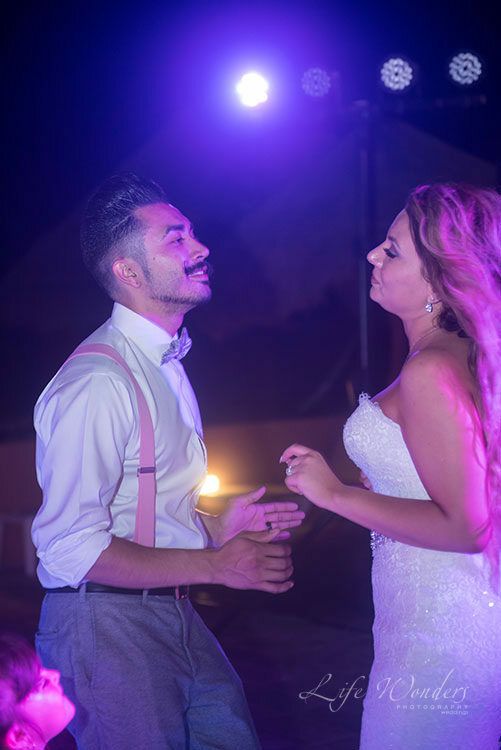 Gazing at each other, Ursula and Dan are such a beautiful couple in love! 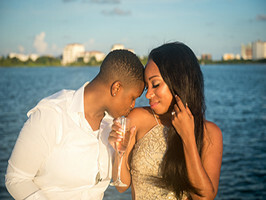 Not all couples opt to have the “first look,” but it is gaining in popularity among couples willing to break tradition. 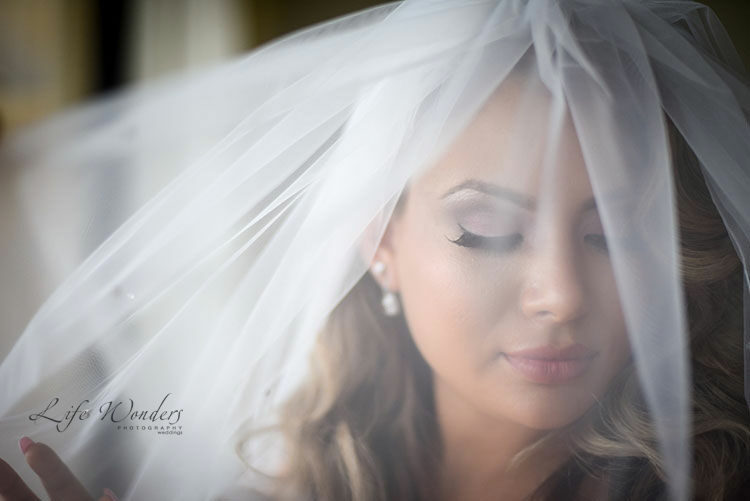 The “first look” is a private moment before the ceremony where the couple meets alone and sees each other for the first time. 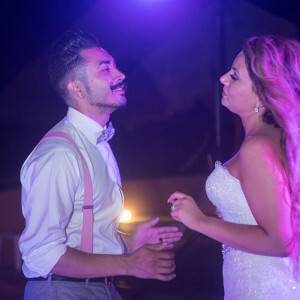 Photos of this moment are so special because they capture the surprise, awe, and relief couples feel as they lock eyes for the last time before they become one through marriage. 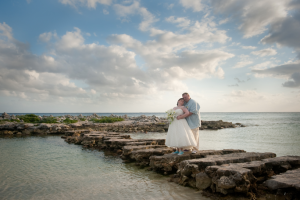 This session is a great option to cut through nervousness … and feel more relaxed as you head to the ceremony site together. 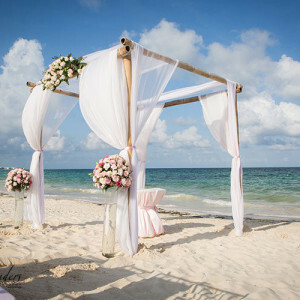 Have a little fun on the beach in your wedding gown. Take a chance on unconventional yet memorable photographs. First and foremost, I must clarify this point: Your dress is not truly trashed during this photo session. 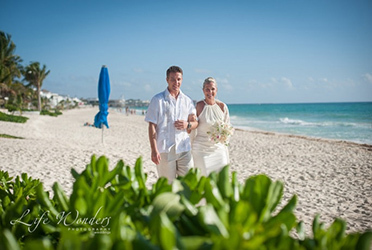 We call it “Trash the Dress” because it may get wet and a little sandy during the photo session. Don’t worry — all it needs is a professional cleaning it will be as good as new. Some brides bring a separate dress for this session. Fun in the sun for Olga an Yelissey! 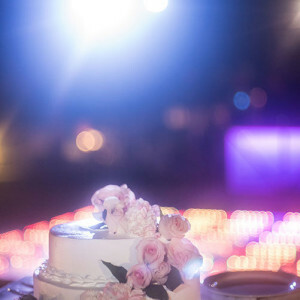 So this is for brides who have a little “rock n’ roll” in them! 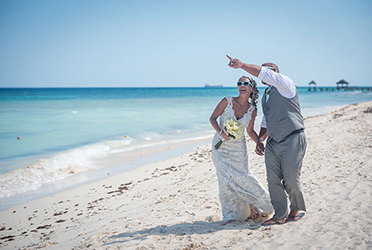 You’re only going to wear your wedding dress once … so after the ceremony, give it proper goodbye with a “trash the dress” session, where the couple takes a fun, splashy swim in their formal attire. I’ll be on hand to capture it all, so that you’ll end up with photos that are creative, heartfelt, and truly one of a kind. 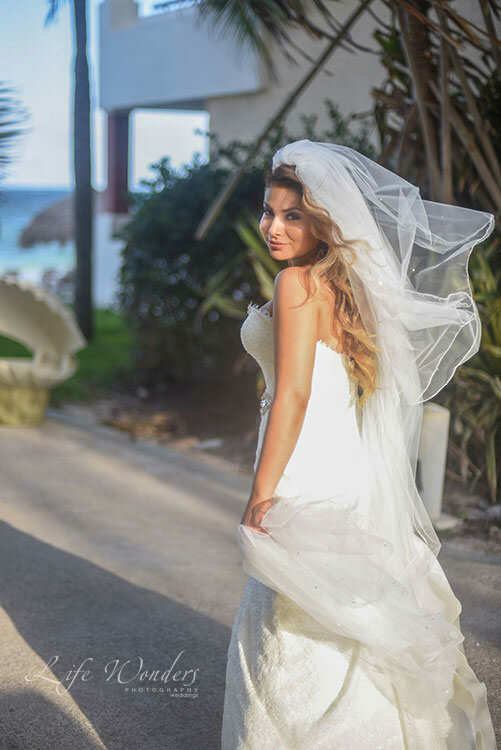 A lively, light-hearted “trash the dress” session is a great way to start a life together. 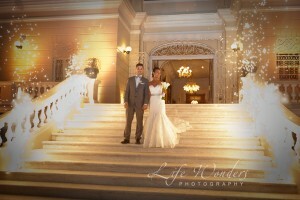 A two hour photo session, will give you Ceremony and Couple portraits. 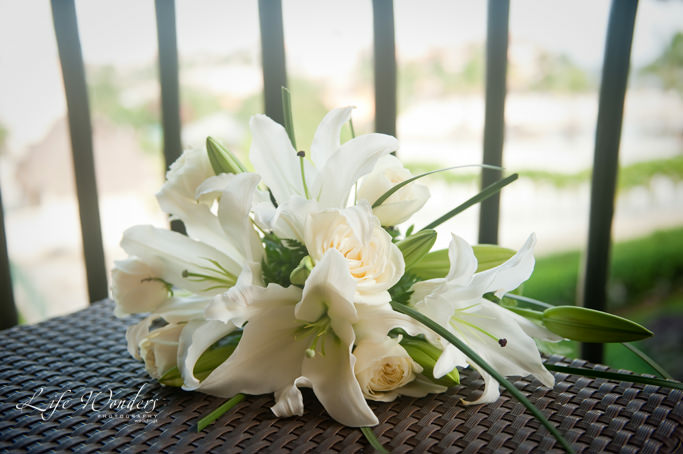 A three hour photo session, will give you Getting ready, Ceremony and Couple portraits. A five hour photo session, will give you Getting ready, Ceremony session, Couple portraits, Bridal portraits, Family portraits and Reception photographs. This is a very popular package and many brides are very happy to they chose this length of time to have me at their wedding. A six hour photo session, will give you Getting ready, Ceremony session, Couple portraits, Bridal portraits, Family portraits and Reception photographs. The difference here is, you get more photographs of each event and I stay longer during the reception. A eight hour photo session is the ultimate. 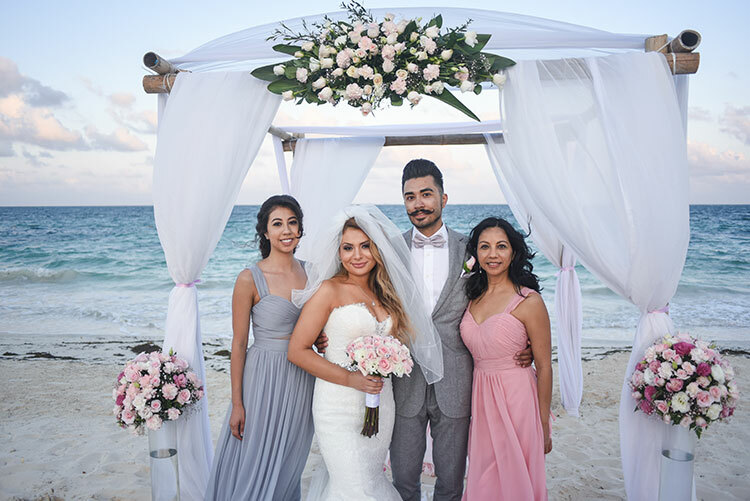 This option will give you Getting ready, Ceremony session, Couple portraits, Bridal portraits, Family portraits and Reception photographs and a lot of great details including beautiful location photographs, so you remember all the details of your wedding and the resort. 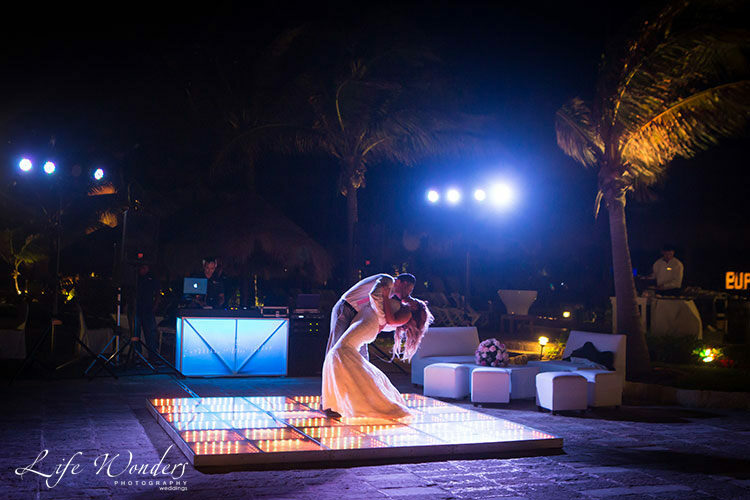 When you picture a wedding, the chances are you think of beautiful women in stunning white dresses, and charming men in flashy black tuxedos. 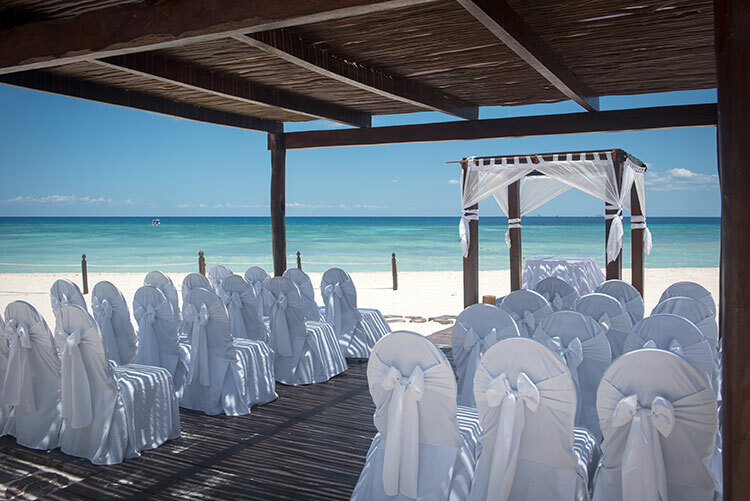 But what about when you’re taking your wedding out of the pages of a catalogue, and onto the sandy beaches of Mexico? Is a groom tuxedo still appropriate? 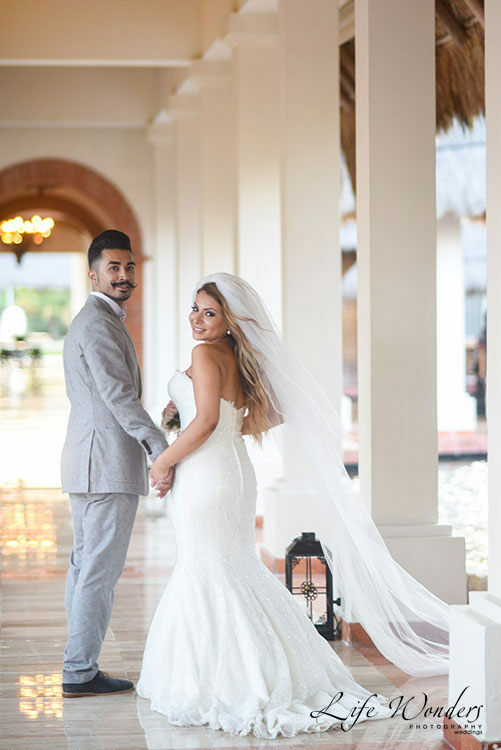 Wearing comfortable clothes is an essential part to keeping a groom content during one of the happiest – and also most nerve-wracking days of his life. 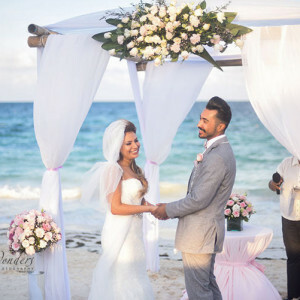 If you consider the hot weather that pervades the Mexican atmosphere, you will realize that the traditional black groom tuxedo option isn’t ideal for beach wedding attire. 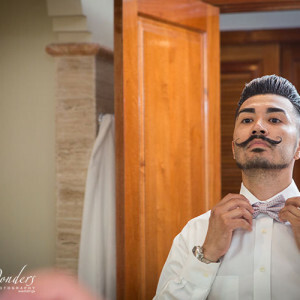 Choosing non-traditional groom attire could be the best way to ensure that your groom remains comfortable, and looking amazing in every one of his wedding photos. One of the first things you’ll learn from any experienced photographer – is that it doesn’t matter how expensive or classy a piece of clothing is, if the person wearing it isn’t comfortable. 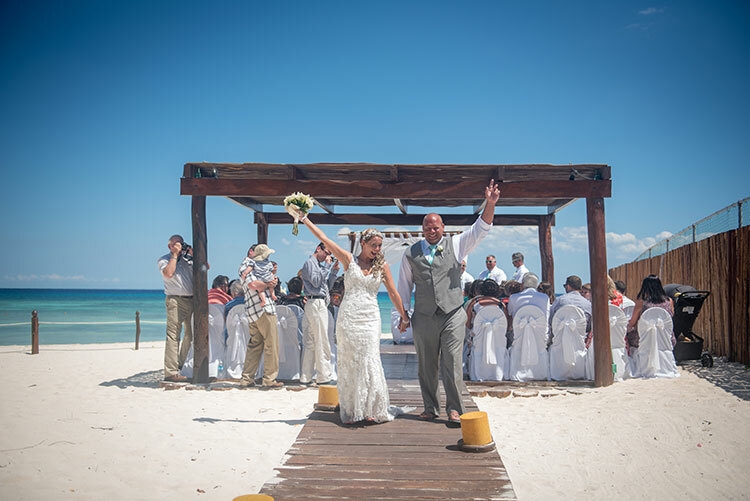 You might think that your pictures are bound to look better if the groom is wearing a classic suit, but Mexico weather runs at about 30 Celsius / 86° Fahrenheit for most of the year, meaning that the heat can quickly take its toll. 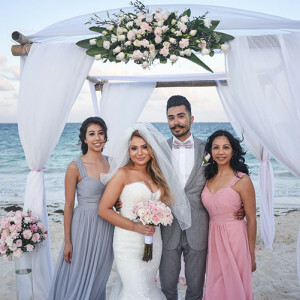 What’s more, sand basically works its way into every fabric, and you’re much more likely to see it on dark colors and black tuxedos than lighter, more casual hues. Instead of the old-fashioned tuxedo, try a cotton or linen material in light colors such as light blue, green, aqua, beige, or white. 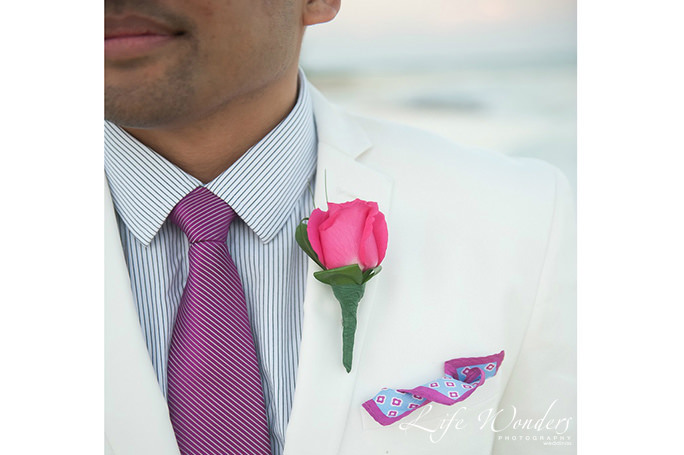 Often times, solid colors give the best effect in photos, since patterned suits can take the focus away from the bride, and give the groom a stocky appearance. 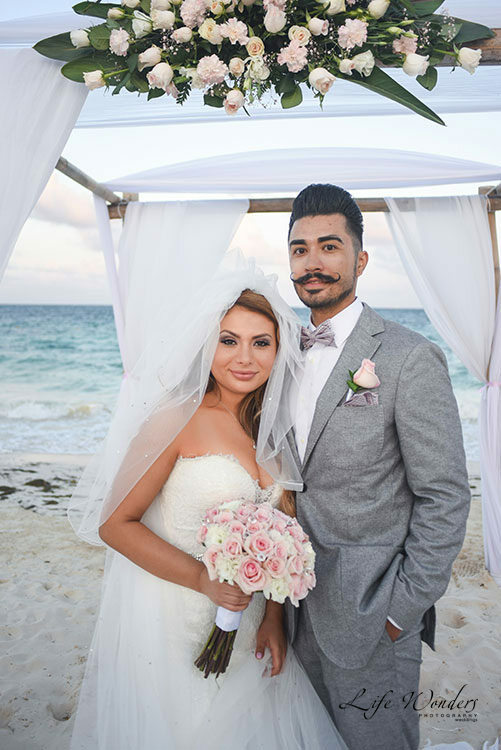 Even if the groom does want to wear a suit, have him try one made of a light fabric that’s capable of breathing well on the beach. He will see how comfortable it is and how good he looks in it. Instead of a long-sleeved jacket, choose a light cotton jacket, a vest, or just a classic and elegant shirt. 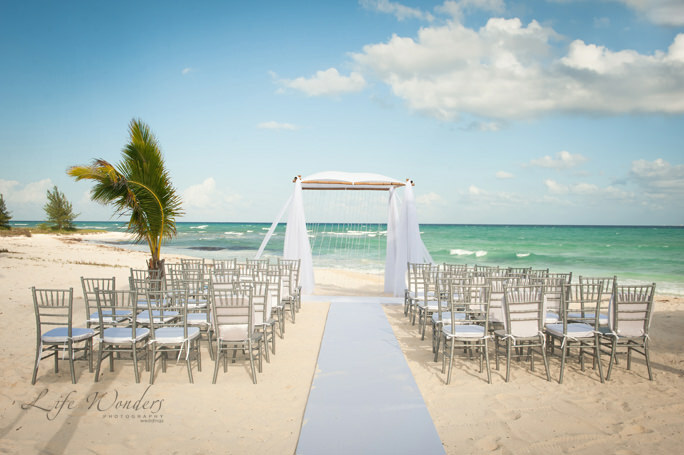 Ditch the restricting leather shoes and open the door that leads to sandals for a beach wedding, or even consider getting rid of footwear all together and walking down the aisle bare foot. 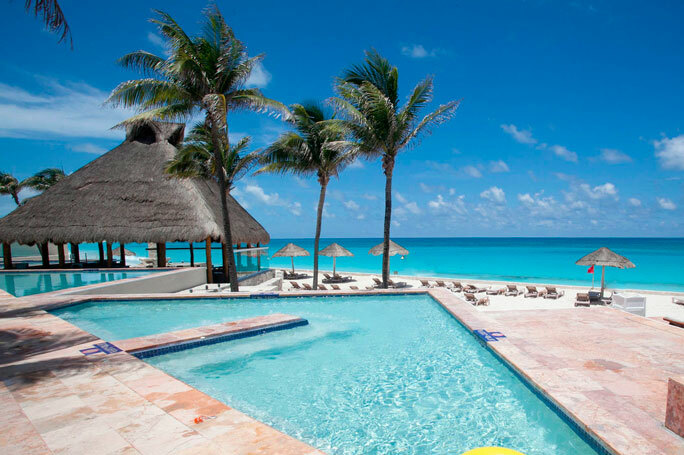 It’ll be a marvelous way to obtain the full beach experience. 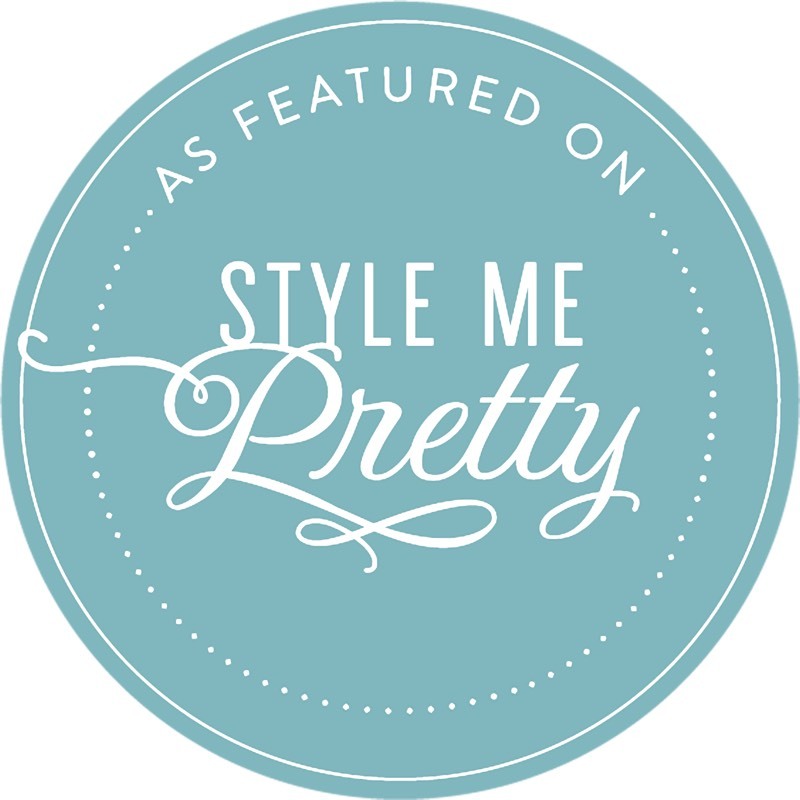 Go for a trendy look – like you’ve just stepped off the pages of a magazine – casual and sophisticated at the same time. You don’t need to wear a suit to look incredible on your wedding day, and there are plenty of weather-appropriate options that can be ideal. I mentioned this before, but I can’t stress it enough. 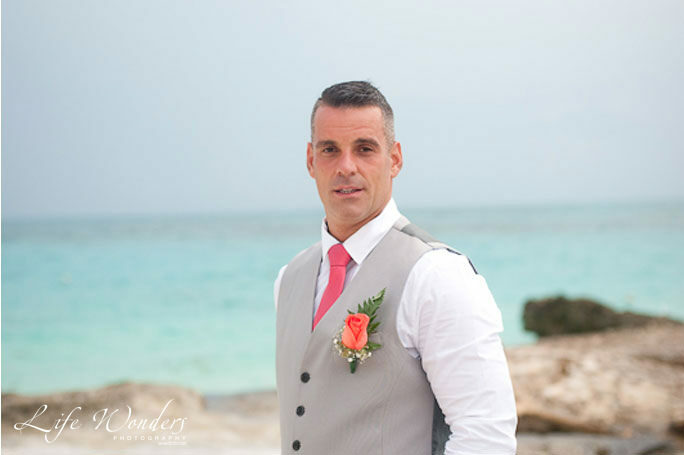 Choosing a casual, less traditional look for the wedding groom attire will help to keep him comfortable and at ease throughout the wedding. 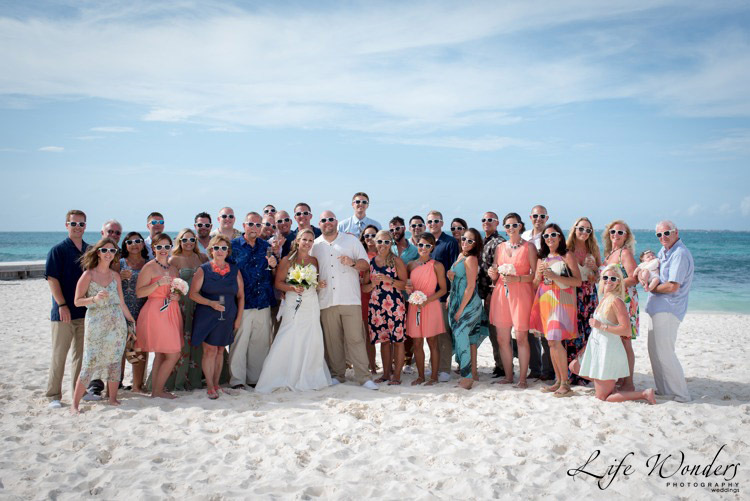 This means that we will soak up genuine memories and happiness in photographs; rather than the agitation of the groom sweating through all of his clothes. 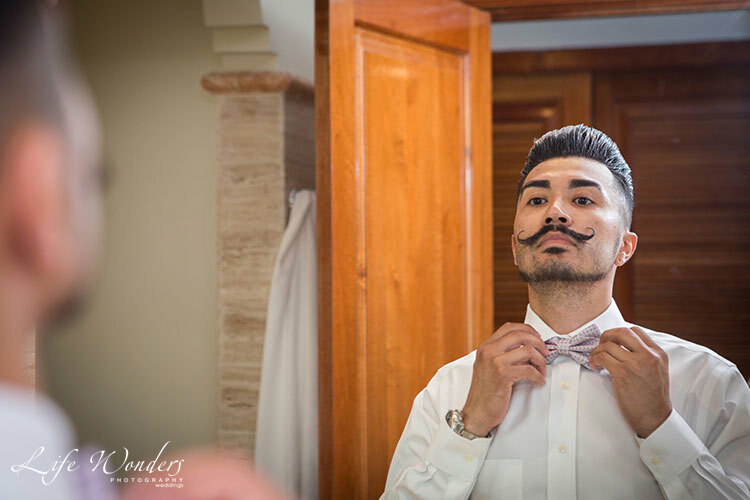 Remember, whatever you choose for your groom to wear, I will be there to help guide you through the steps to grab those perfect images. 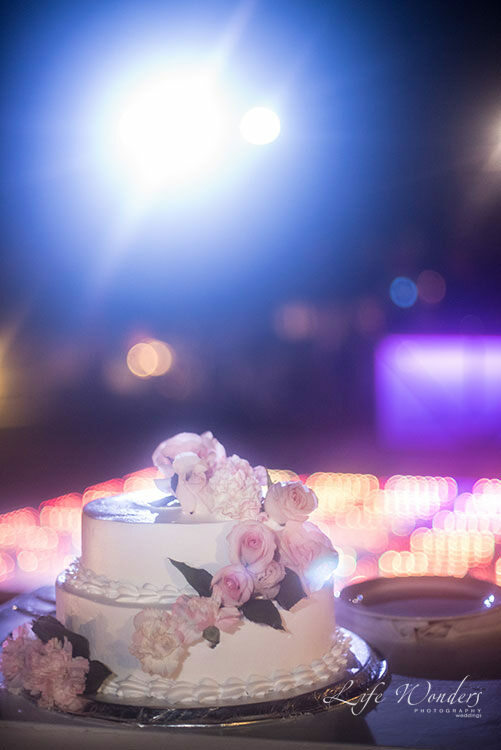 This is while making sure that the final product is a sequence of memories that will sparkle for a lifetime. 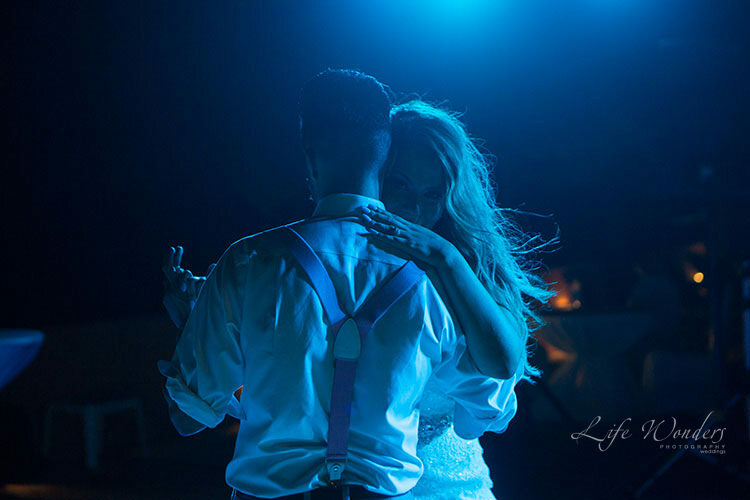 Contact me today to talk about your wedding outfit, and plan your photography event.